The Mercy change that recently hit the Overwatch PTR is now going live for all platforms. 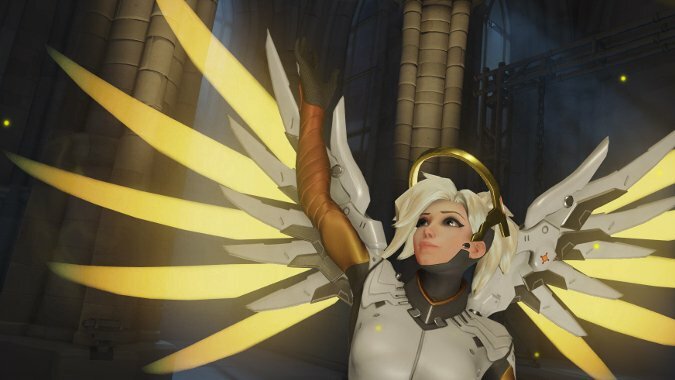 Mercy’s most controversial ability, Resurrect, got even more retooling. She also got a bit of a buff at the same time they gave her a de facto nerf by fixing a momentum bug that cropped up after last patch. Lucio got a similar de facto nerf and slight buff out of the same bug. It’s tough to say where the next step is for the development team with Mercy if they don’t like how it ends up. Making her slightly more slippery with that unintended buff may be a step in the right direction. One of the things that makes Mercy unique is a lot of the skill in playing her is found in spacial awareness more than aim, as in a typical shooter. Though Mercy “hiding” isn’t a great thing, finding those ledges to duck behind while amping or healing is what makes her sometimes tough to counter. As with many healing classes, a lot of your biggest opponents may be your teammates, who go around a corner just as you get in Guardian Angel distance to escape. It’s difficult to keep a hero like Mercy accessible to all skill levels while still maintaining difficulty and keeping things fun across the gamut. I don’t envy the developers this task in the least. A new patch is now live. Read below to learn more about the latest changes. Developer Comment: Valkyrie no longer resets or reduces Resurrect’s cooldown. Instead, it now provides an extra ‘charge,’ allowing you to revive an ally even if it is still on cooldown. If the bonus charge hasn’t been spent when Valkyrie ends, it will be removed.